For some strange reason this comic book created by Mark Waid and Chris Samnee, reminds me of the following joke. A man walks in on his son and notices straight away that he's playing with his... errr... unmentiontionables. 'Stop doing that this instant' says the father to the son. 'If you don't stop, you might go blind' he then continued. In response the boy then turned to his Dad and said to him, 'But Dad, I'm over here!'. Ha! Take that Marvel Comics, in May, 2014! To QUOTE Mahatma Gandhi: 'An eye for an eye only ends up making the whole world blind'. Through your paper-thin walls, Matt Murdock, I could hear everything the Deputy Mayor has told you. For a start, I could hear her describe the circumstances surrounding your old adversary setting up shop in San Francisco. Then I could hear you laughing out loud when she mentioned his name, 'The Owl'. And after that, well, she talked about me, didn't she? She talked about me until you suddenly heard me skulking about upon your roof-top. Forcing you to jump into action and confront me, man to man. But now that you have, what do you think about our confrontation, eh? Are you impressed by it? Are you perplexed by it? Or are you in agreement that we both have to team-up or else someone will die? Come one, Daredevil. I'm waiting for an answer. I haven't got all night you know. The Shroud does have other things to do! Overall I'd say this issue of Daredevil was a really jazzy book, daddy-o. Not only because the central narrative had a somewhat be-bop tone to it. But in addition to this the artwork was additionally jazzy as well, largely due to the fact that it looks jazzy on the page. Jazzy, just like a jazz band that's won ten consecutive jazzy jazz-band competitions on the trot. Yeah. Straight up, dear reader! Aesthetically this tale had a very bohemian manner of presenting itself in both style and in content. For example, I haven't seen a bad guy eavesdropping on a good-guy since I last watched a sixties film-noir. 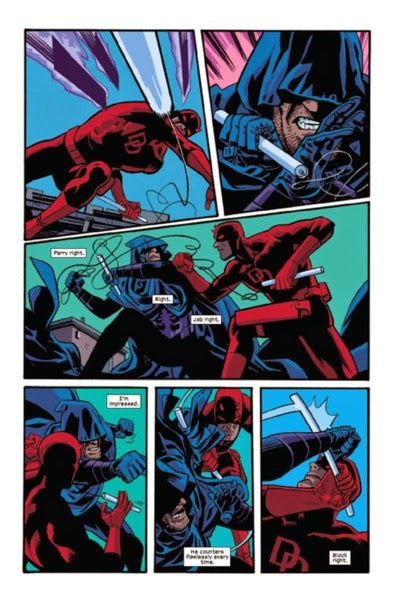 Also, that whole scenario where the Shroud comes across like Daredevil's opposing half was a right blast, and I honestly can't wait to see how this will all play out next month. The only thing that annoyed me about this adventure was that section where it alluded to Foggy Nelsons fate without giving very much away. I mean, for crying out loud! How much longer do I have to wait before I know what's happening to our old friend? On a conceptual level this tale is about two men who are very similar yet very different at the same time. So that's why I think it would be a pretty good musical-match for the Beatles ditty, 'The Two of Us'. Yes. That is correct, dear reader. I am comparing this comic book to another comic book. 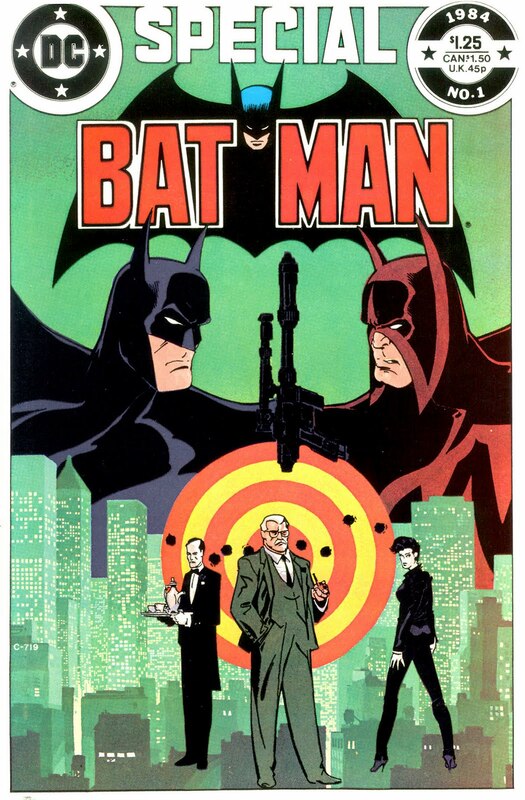 And that other comic book is none other than a Batman comic book as well. You see, in a one off special published by DC in 1984, Mike W. Barr and Michael Golden created a character called the Wrath, who was in essence the ying to Batman's yang. So I'm sure you can now see what I'm driving at in its relation to this story. Through no fault of his own Foggy was run over by a sexually perverse steamroller driven by Kim Kardashian's subconscious. When he heard the news that Ben Affleck was going to star as Batman in the new 'Man of Steel' movie, for some strange reason he took it upon himself to justify this casting choice to a savage crowd of Mormons. After he was cured of cancer, one of his doctors accidentally shot Foggy in the head nineteen-hundred times with a flu jab. Foggy was in the process of becoming a 'Beliber', when suddenly he realized what the f*ck he was doing, and so he decided to end his life by visiting Harlem dressed as a member of the KKK. From out of nowhere he was crushed to death by a flying pig. Matt Murdock is in fact Foggy Nelson, and Foggy Neslon is in fact Wonder Woman. Foggy Nelson isn't dead; he's mealy resting, pining for the fields, like a Norwegian Blue... Parrot that is.